Police found four children 12 and younger at Erin Lee Macke's home, making their own dinner while an unsecured gun was on a bedroom shelf. Erin Lee Macke left her 12-year-old twins and 6- and 7-year-old daughters at home. 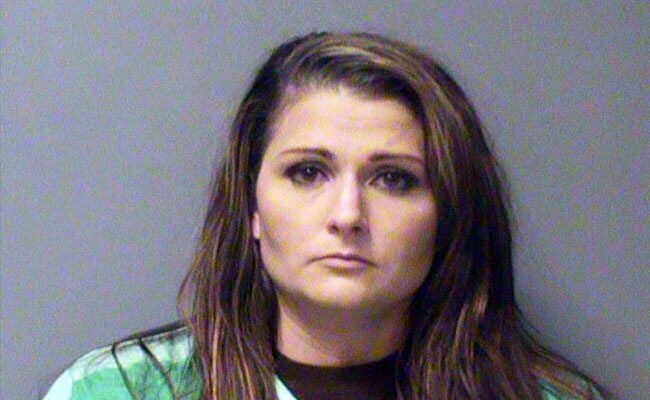 Police say Erin Lee Macke left a gun on her bedroom shelf and her four young children to fend for themselves, and jetted off last week for an 11-day vacation in Europe - cut somewhat short by the mother's arrest Thursday on child endangerment charges. Macke left her 12-year-old twins and 6- and 7-year-old daughters at home near Des Moines, Iowa, on Sept. 20 to visit relatives in Germany, Lynn Aswegan with the Johnston Police Department told People. By all indications, he said, "it was a social venture." Indeed, the 30-year-old mother got to see the Danube River and the Walhalla Memorial before police cajoled her back to the United States, according to vacation photos shown by Inside Edition. "I wish I could say I'm surprised, but I'm not," her ex-husband Matthew Macke told the outlet. Macke had planned to return on Oct. 1, police said in a statement, but someone asked them to check on the children about 24 hours after she left. They had been alone the whole time, Aswegan told People. At some point, the police lieutenant said, Macke had talked to some relatives about watching the kids, but they had conflicts. "She gave them the indication she had it taken care of," he said. "She felt comfortable that the kids were responsible enough to take care of themselves during that duration." When officers arrived at the home that evening, Aswegan told People, they found the twins preparing to feed their little sisters. And one of the 12-year-olds led them to the absent mother's bedroom, he said, where she had left a gun and ammunition on an open shelf. Authorities notified child protective services, and got in touch with Macke in Germany. "She didn't understand or agree with the concern," Aswegan told People. But police told the mother to fly back home. She did - a full week later, and was promptly arrested on Thursday. In addition to the child endangerment charges, Macke was charged with giving a minor access to a gun. In green prison stripes, she appeared in a Polk County courthouse Friday, as a judge told her to find an attorney and prepared her to go free on a $9,000 bond before trial. Macke could not, the judge stressed, see her children in the interim. "You are to have no contact with them - direct, indirect, writing, phone, voice messaging, text messaging," the judge said, in video taken by KCCI. "No contact whatsoever. That includes going to the address." "I don't go there, or they don't go there?" Macke asked. This led to a confused exchange between the defendant, judge and a county lawyer, as the court tried to determine whether the children were still at Macke's house. The lawyer said she had no confirmation that child services had placed the children elsewhere, while Macke sounded certain they were all safe with relatives.